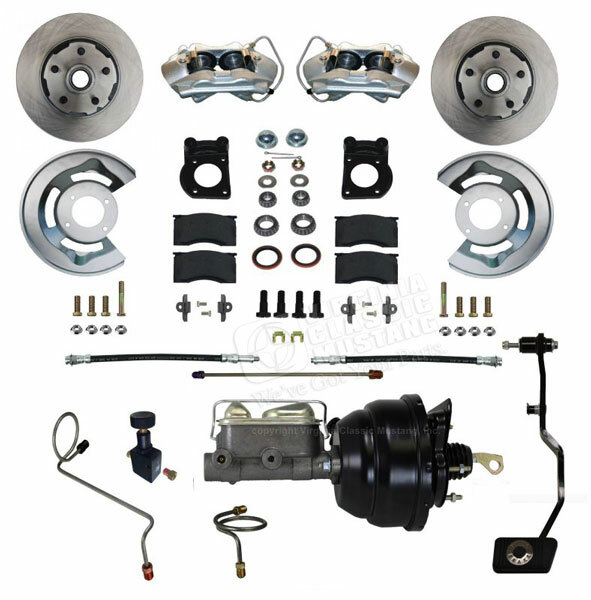 •Drum to disc brake conversion kit with 4-piston cast iron calipers; power. Bolts to 6 cylinder or V8 drum brake spindles. For manual transmission Mustangs only. •*NOTE: Most 6 cylinder cars have a 4 x 4.5" bolt pattern - this kit will convert the front only to a 5 x 4.5" bolt pattern. •For manual transmission Mustang only. •Includes master cylinder and 8" dual diaphragm booster.